The Salon International de la Haute Horlogerie (SIHH), one of the watch industry’s most important annual exhibitions, kicks off this coming Monday (January 14th, 2019), and already we have four new IWC Pilot’s Watches to look forward to this year, which will make their official debut at the show. Read on for a preview of the new IWC Pilot’s Watches for SIHH 2019. IWC has announced 4 new Pilot’s Watch models which will be making their official debut at SIHH 2019 (Image Credit: IWC). IWC Pilot’s Watch Timezoner Spitfire Edition “The Longest Flight” (Image Credit: IWC). Thanks to Steve Boultbee-Brooks and Matt Jones, founders of the Boultbee Flight Academy, a restored 1943 Spitfire aircraft will embark on a journey around the world, starting next summer. In addition to being a supporter of the project, IWC has also unveiled Spitfire editions of their famous Pilot’s Watch models to commemorate the partnership. 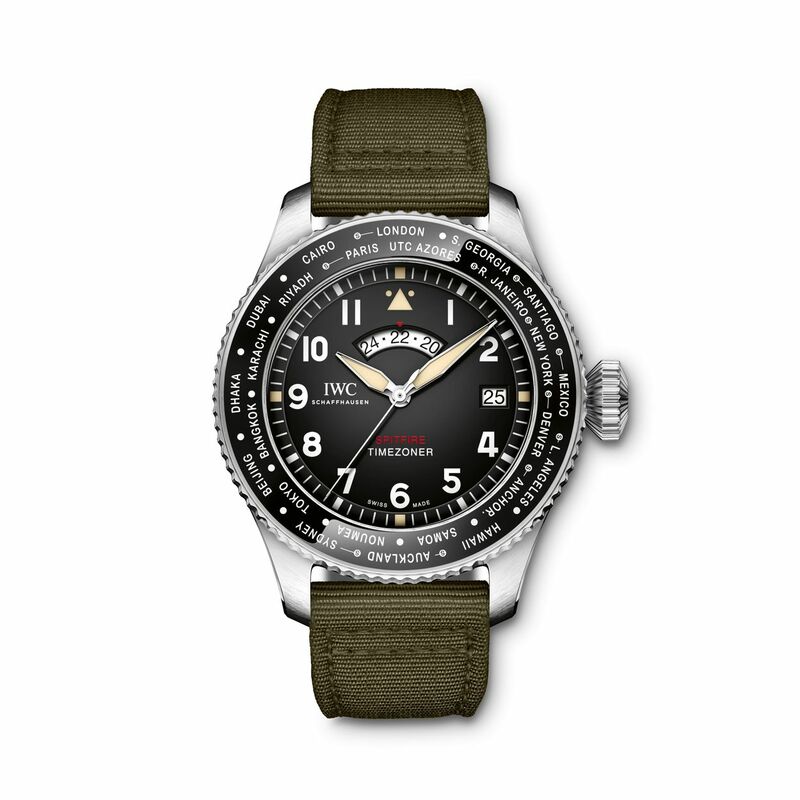 One of them is the new IWC Pilot’s Watch Timezoner Spitfire Edition “The Longest Flight” (ref. IW395501). Limited to only 250 pieces, the new IWC Pilot’s Watch Timezoner Spitfire Edition “The Longest Flight” brings together, for the first time, the patented Timezoner mechanism (which displays another time zone via the rotating bezel) with an in-house automatic movement. The new IWC Pilot’s Watch Timezoner Spitfire Edition is inspired by the appearance of the Spitfire’s cockpit, and sports a 46 mm stainless steel case, black dial, and green textile strap. 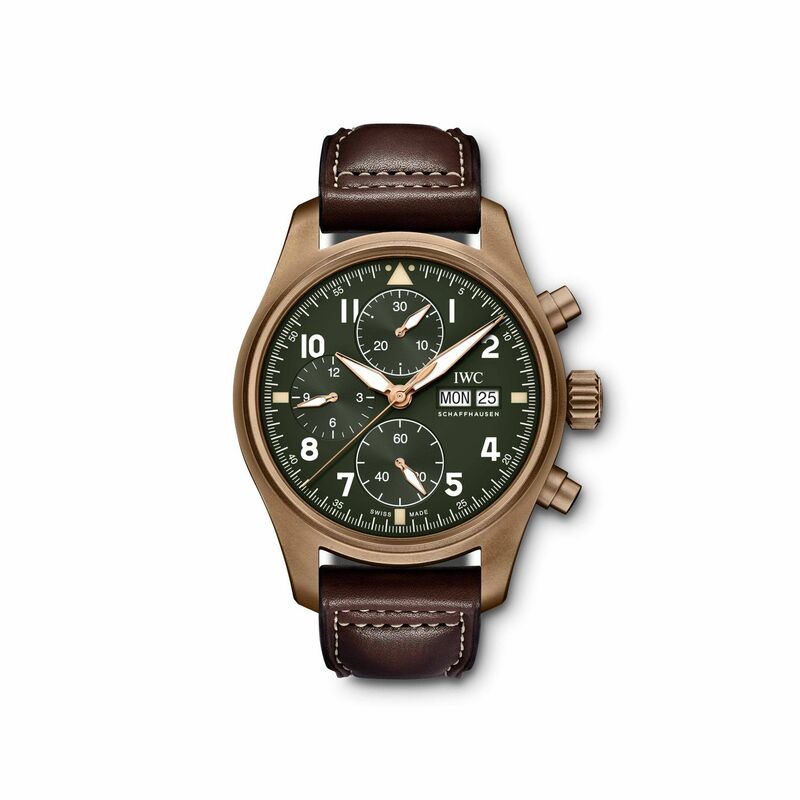 IWC Pilot’s Watch Chronograph Spitfire (Image Credit: IWC). The new IWC Pilot’s Watch Chronograph Spitfire (ref. IW387902) takes its design cues from the 1948 Mark 11 navigation watch created for the Royal Air Force. Featuring a 41 mm bronze case, olive green dial, and brown leather strap, the exterior of the new IWC Pilot’s Watch Chronograph Spitfire flaunts a vintage vibe, while inside the case sits the modern in-house IWC 69370 automatic chronograph movement. In addition to the soft-iron inner case that protects the movement against disruptive magnetic forces, the exterior caseback is made from titanium. It’s worth pointing out that 41 mm is a reduced size for the typically oversized, Pilot’s Watch chronograph collection – something that we are sure will be welcomed by members of the watch enthusiast community that prefer the smaller case sizes of vintage watches. IWC Big Pilot’s Watch Constant-Force Tourbillon Edition “Le Petit Prince” (Image Credit: IWC). By far, the most exclusive model among the four new IWC Pilot’s Watches for SIHH 2019 is the Big Pilot’s Watch Constant-Force Tourbillon Edition “Le Petit Prince” (ref. IW590303). 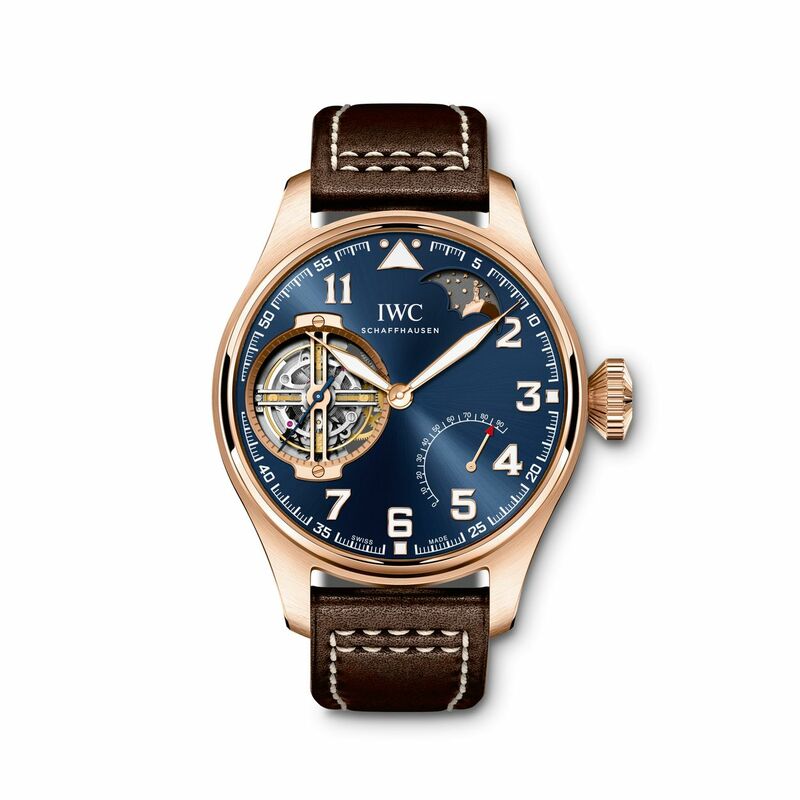 Not only is this timepiece the first IWC pilot’s watch to be fitted with a constant force tourbillon mechanism, but it’s also fashioned from a material that the company calls “hard gold” – which is a new blend of 18k red gold that is significantly more durable than traditional 18k gold alloys. Oh, and IWC will only make 10 pieces of this highly-exclusive Pilot’s Watch. Fitted inside the large 46.2 mm “hard gold” case is a vibrant sunburst blue dial that houses a moonphase display, a power reserve indicator, and a tourbillon – all placed alongside the familiar, propeller-shaped center hands and stylized Arabic numerals. 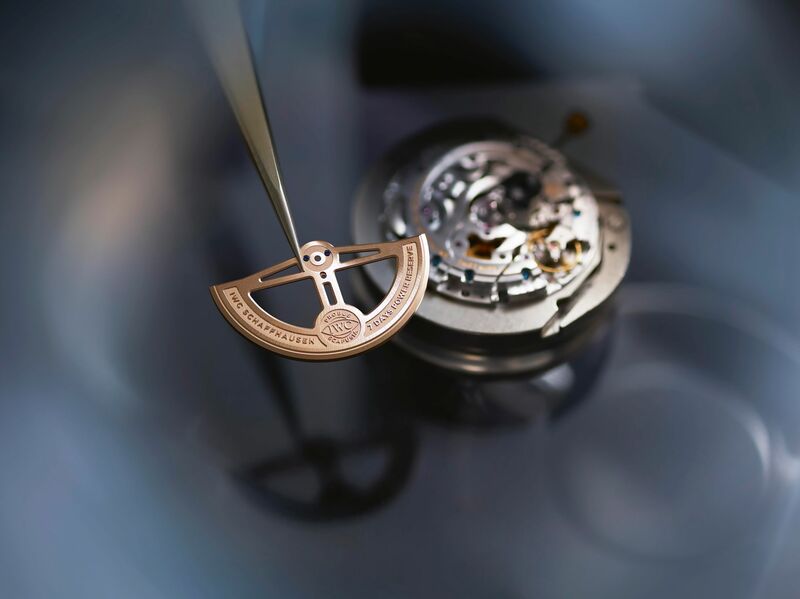 The reverse side of the case permits a view of the manually wound, in-house Caliber 94805 movement. 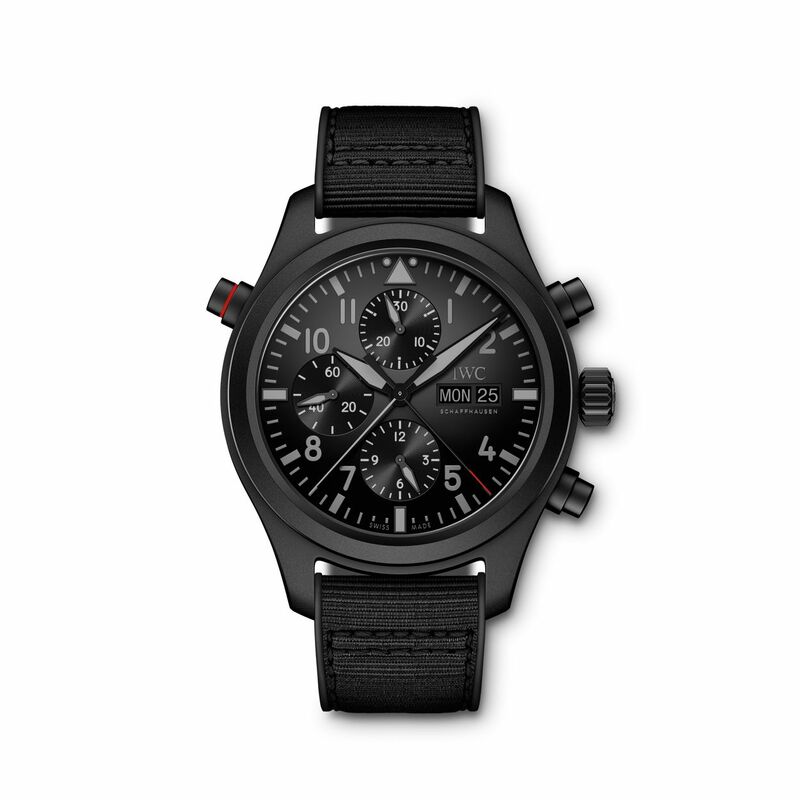 IWC Pilot’s Watch Double Chronograph TOP GUN Ceratanium (Image Credit: IWC). Since 2007, IWC has offered a line of TOP GUN watches named after the U.S. Navy’s Strike Fighter Tactics Instructor Program, and built to meet the standards of today’s elite jet pilots. For the newest edition of the modern military-inspired timepiece, the new IWC Pilot’s Watch Double Chronograph TOP GUN Ceratanium (ref. IW371815) is crafted from IWC’s proprietary Ceratanium material, which brings together hard ceramic and lightweight titanium. Thanks to the innovative material, the 44 mm Ceratanium case of the new TOP GUN watch is resistant to scratching, corrosion, and does not reflect any light, which could be dangerously distracting to pilots during flight. The black case is fitted with a black dial, black hands, and a black rubber strap resulting in IWC’s first ever, all-black Pilot’s Watch. The new IWC Pilot’s Watch Double Chronograph TOP GUN Ceratanium runs on the Caliber 79230 automatic movement, which supplies the watch with a split-seconds chronograph function in addition to its time, date, and day features. As always, pre-SIHH announcements are just the tip of the iceberg of what’s to come in terms of new luxury watches. Given that IWC has chosen to give us a sneak peek at not just one, but four new IWC Pilot’s Watches, we can only assume that the brand has more big things planned for Geneva this coming week.